This lensatic compass from CAMMENGA has been used as an alternative to the tritium version for decades. It is the same compass CAMMENGA supplies to the US Military. This is the real deal! This is NOT a replica. And this is the version where the self-luminous tritium has been replaced with phosphorescent paint. This compass features both a 0-6400 mils scale (20 mil resolution) and a 0-360 degree scale (5 degree resolution), with an accuracy of +/- 40 mils. 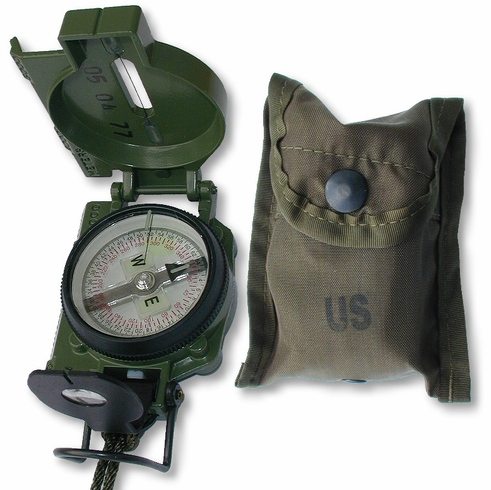 Other features of this most rugged and accurate compass are a sapphire jewel bearing, rotating bezel, a magnifying sighting optic, cast aluminum frame, olive drab LC-1 pouch with belt clip, induction dampening, and a climate capacity ranging from -50 to +150 degrees F.
Same as National Stock Number: 6605-01-196-6971. Mil Spec: MIL-PRF-10436N, except luminosity of this compass is phosphorescent paint, not tritium. Also available in an attractive presentation gift box.